In this fast-paced era, we are always on the lookout for quick and easy-to-make dishes. And this is why noodles and pasta remain a mealtime favorite, enjoyed at home and gourmet restaurants across the world. But most of us who like eating noodles and pasta, usually buy them in packaged form, which are loaded with calories, synthetic flavorings and preservatives. Why buy packed instant noodles and pasta when you can make healthier versions of the same at home? Making noodles and pasta at home is time-consuming, when done entirely by hand. 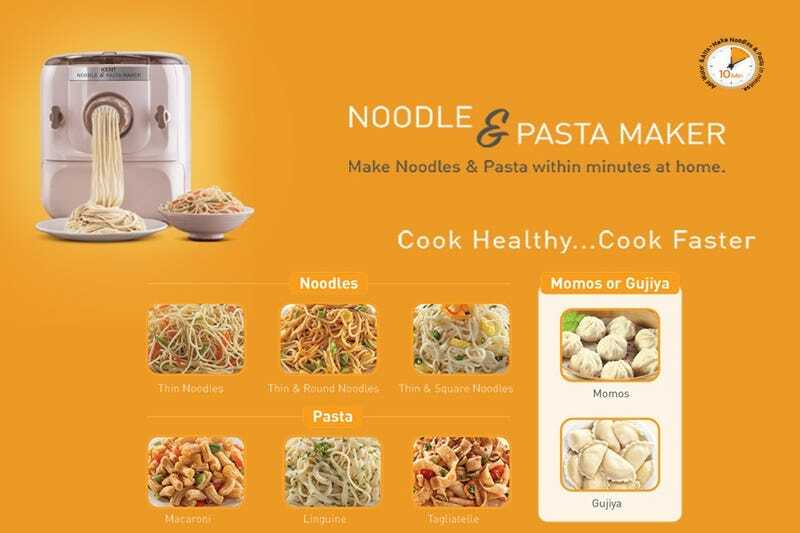 However, with Kent’s Noodle And Pasta Maker, you can make homemade noodles and pasta within minutes! The best thing about using Kent’s Noodle and Pasta Maker is that you get fresh, healthy, chemical and additive-free noodles and pasta. Another amazing utility of this appliance is that you can decide the shape, size, flavor and other ingredients that you want to add to your noodles and pasta according to your preference. Further, this appliance is fully-automatic and easy-to-use and maintain. Why you need to clean and maintain your Kent’s Noodle And Pasta Maker? Home appliances are there to make your life easier and comfortable. But, an appliance cannot keep on functioning flawlessly unless it is cleaned and maintained regularly. Many appliance issues and problems can often be solved by regular cleaning and maintenance. Besides, keeping your appliance in top working condition, regular cleaning and maintenance minimizes the chances of breakdown, saves the money you spend on costly repairs, and extends the lifespan of your appliance. You don’t need technical expertise to clean and maintain your Kent Noodle and Pasta Maker. Just read the user manual and put your common sense to use. You will have to clean the appliance after every use to keep it working and looking like new. The Kent Noodle and Pasta Maker comes with an ‘instruction manual’ and a cleaning brush. Read the ‘cleaning and maintenance’ section of the ‘instruction manual’ to understand about the cleaning and maintenance of the appliance. Press the ON/OFF button to turn off the appliance and then unplug it. Open the lid and remove it. Next, remove the knob by rotating it in counter clockwise direction. Take out the shaping dies. Loosen the locking screw and remove the front panel, mixing paddle and mixing chamber. All the detachable parts have been removed now. Wash these parts and use a clean cloth to wipe them dry. Use a dry cloth to wipe off any flour residues on the body of the Kent Noodle and Pasta Maker. How to clean the shaping dies? After each use, you need to clean the shaping dies. After the extruding process is complete, remove the dies and let them dry. Use the cleaning brush that is provided with the Kent Noodle and Pasta Maker, to clean the shaping dies, when dry. You can also clean the dies by placing them in the refrigerator for about 30 minutes and then cleaning with the brush provided. With routine cleaning and maintenance, you are extending the life of your Kent Noodle and Pasta Maker. However, make doubly sure to read the instruction manual carefully before you use or clean your appliance.